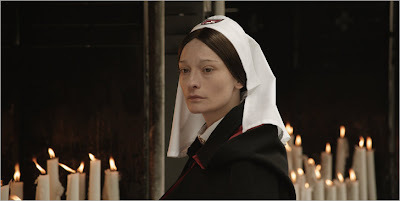 The less one knows about Jessica Hausner's Lourdes before seeing it, the better. I knew next to nothing about the film or its story going in, and recommend that anyone else approaching it should do the same to appreciate the full power of the experience. So I issue fair warning before reading on. Lourdes is a kind of intelligent, transcendent film rarely seen in modern cinema. 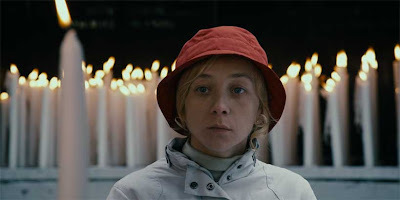 If cinema is the supreme medium in which to express all feelings through a combination of all the fine arts, then Hausner uses all the resources the form allows to craft something that engages both the heart and the mind, at once cerebral, emotional, and spiritual. It is not a religious film, although it could easily be read as one. Just as it could be read as the exact opposite. It is a film of mysteries and questions, centered around a paraplegic woman named Christine (Sylvie Testud), paralyzed from the waist down, on a pilgrimage to Lourdes, France, revered by Catholics as the site of many miraculous healings. Accompanied by nuns, volunteers, and others seeking healing, both spiritual and physical, Christine seeks healing more out of casual healing than religious devotion. The pilgrimages she takes are more an excuse to get out and see the world from her wheelchair than any real hope of a miracle. While those around her devote themselves to being healed, beseeching God to hear their prayers, or questioning the validity of the entire affair, Christine simply observes, a casual participant in the sacred rituals. But something will happen that will shake the skeptics and challenge the believers, something unexplainable that will touch them all. Some will feel doubt, others jealousy, and still others deep exultation. Hausner provides to answers, nor does she lead her audience to any one conclusion. Each audience member is left to their own interpretation based on their own experiences and viewpoints. Is it a stinging indictment of peddling faith as commodity? Is Lourdes merely a tourist trap set up to rob the faithful of their money by offering cheap statues of the virgin Mary, bottled Lourdes water, and false hope of being healed of their afflictions? Is it a meditation on the nature of miracles, be they medical or metaphysical? Are they mental constructs sprung from a mixture of practical reasons and wishful thinking? Or do they truly come from the hand of God? In fact Lourdes is all of these things, and more. There is something truly haunting about the way it seems to exist in a kind of in-between place, between faith and reason. Hausner directs with a kind of tremulous beauty, every frame, every nuance has a kind of gossamer perfection, luring the audience into a kind of spiritual experience all its own. There is an intelligence in its construction, a probing sort of wisdom intent on exploring the deep seeded human desire to see the divine, to make the intangible somehow tangible, or to make apologies and explanations for that which cannot be seen or proven. The power of great art comes from its ability to be interpreted by the beholder. Each viewer brings to the table a set of viewpoints and life experiences that make up who they are and inform how they will see a film. Hausner knows and embraces this, offering up a film that defies easy categorization and simplistic descriptions. It exists squarely in a world of mystery and uncertainty, deftly avoiding political hot buttons in favor of something much more profound. The brilliance of Lourdes stems from its enigmatic nature, its ability to be spiritual without being religious, to question without being cynical, to embrace both faith and doubt without judgment - and that is a miracle in itself. 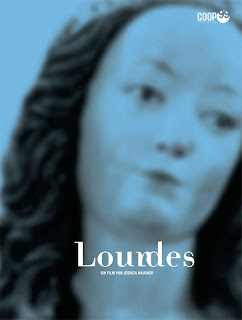 LOURDES; Directed by Jennifer Hausner; Stars Sylvie Testud, Léa Sedoux, Gilette Barbier, Elina Löwensohn, Katharina Flicker; Not Rated; In French w/English subtitles; Opens today, 2.17, at the Film Forum in Manhattan. Nothing you say here surprises me. I will be seeing this tonight at the Film Forum in Manhattan.